Mazzer ZM back plate. Daily Coffee News photo. Longstanding espresso grinder manufacturer Mazzer Luigi SPA has been a go-to name in the espresso grinding game for cafes of all sizes throughout the evolution of the specialty coffee scene over recent “waves” and trends. Enduring workhorses such as the flat-burred Super Jolly and Major, and the conical-burred Kony and Robur, have been flanking espresso machines far and wide. 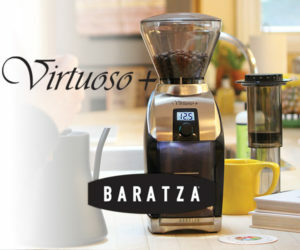 The Mazzer Mini, too, has been a popular option for lower-volume decaf grinding as well as for the home espresso market. 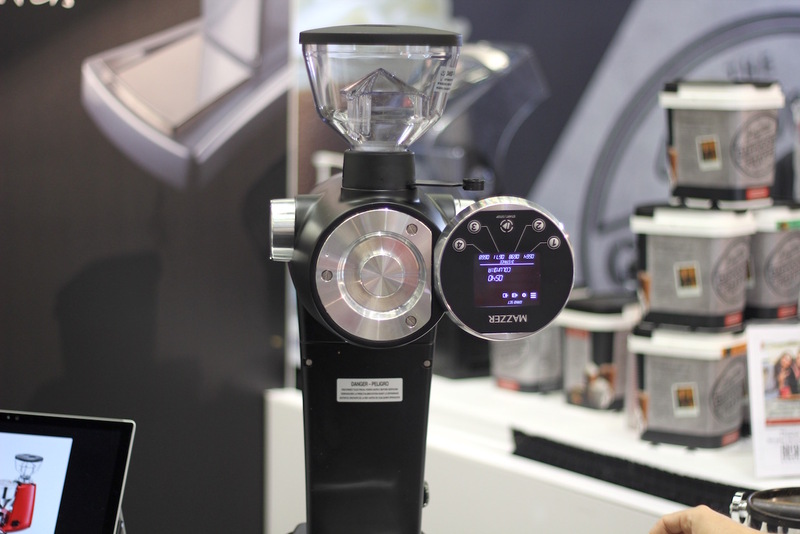 Now in its 69th year of operation, the Mazzer company revealed a new angle at the SCA Global Specialty Coffee Expo in Seattle last week: Grinders specifically for filter methods of brewing. The flagship of this new direction is the ZM, a high-tech, vertically oriented, 83-mm, flat-burred grinder engineered for precision in setting and repeating a designated fineness and for as little retention as possible. 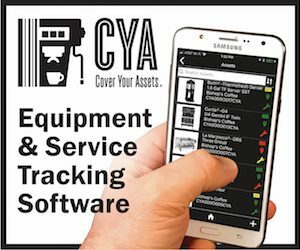 A digital screen displays settings, presets and other stored usage stats and info. Users navigate the system using buttons below the screen, and a knob on the grinder’s side helps in fine-tuning its micrometric gradations. Its onboard memory stores 20 user-settable burr positions, all of which can be named and four of which can be displayed on the front screen at a time. The grinder contains a proprietary system for detecting burr proximity, through which it not only maintains all these micron-precise settings but also self-calibrates, allowing users to remove and reinstall burrs and, with a single button, instruct the machine to find its own zero point and then automatically recalculate and restore the full selection of settings for convenient, ongoing precision and repetition, including to account for burr wear. For maintenance, the circular screen panel slides up and out of the way to reveal the grinding chamber sealed by just three large screws, providing easy access. The machine ships with burrs cut for particle consistency and optimal output for filter methods, which are oriented vertically inside the grinder for a clear path from the hopper to the receptacle, thereby encouraging total passage of grinds and minimal retention. 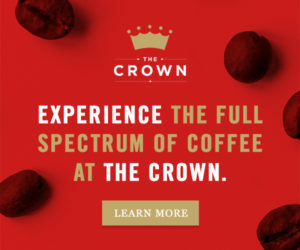 The company contends that after certain gaps and crevices inside the machine are initially filled with what they say amounts to about 0.45 grams of coffee, retention is consistently zero. The Mazzer ZM removable touchscreen for easier cleaning and maintenance. Daily Coffee News photo. “We started in Italy in 1948 manufacturing grinders. 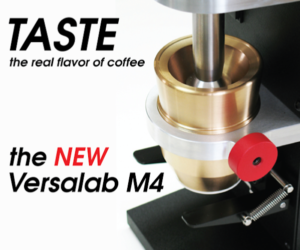 Since this time we have been manufacturing grinders just for espresso. 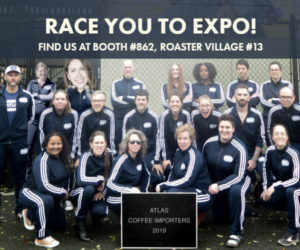 Of course, the company’s becoming larger and larger, and the goals are different now,” Mazzer Head of Global Sales Lucca Maccatrozzo told Daily Coffee News at the Expo. Maccatrozzo described a concerted effort made by the company to forget much of what it knew after almost 70 years of making grinders for espresso, in order to reorient its collective perspective to design something innovative and effective for the substantially different field. 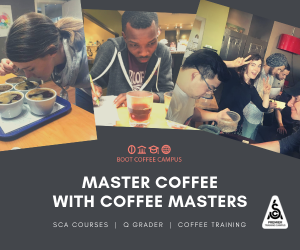 Training by the SCAE in the many varieties of filter coffee practiced around the world included a three-day tasting and palate educating marathon for Mazzer staff, culminating in what has emerged in the form of the ZM, Mazzer’s first concept specifically for filter grinding. The Mazzer Mini collar. Daily Coffee News photo. 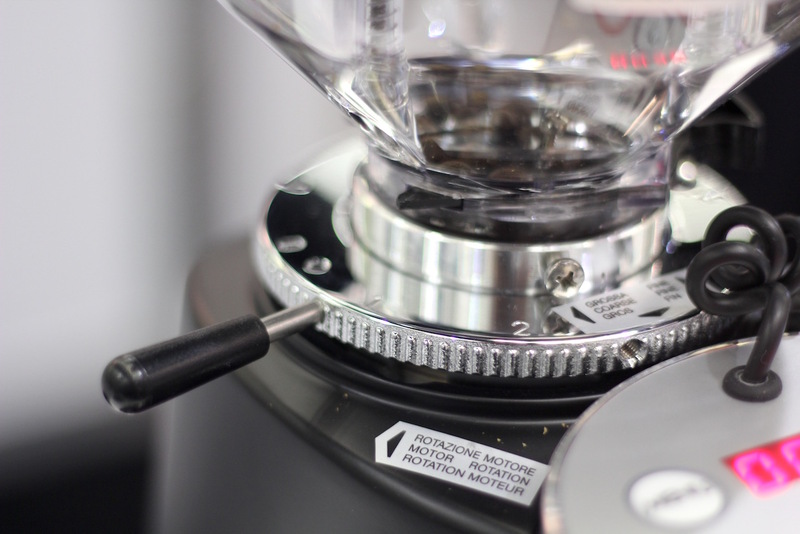 An additional set of ZM burrs will also be available for espresso of course, and Maccatrozzo said that there will soon come an attachment for grinding directly into a portafilter. 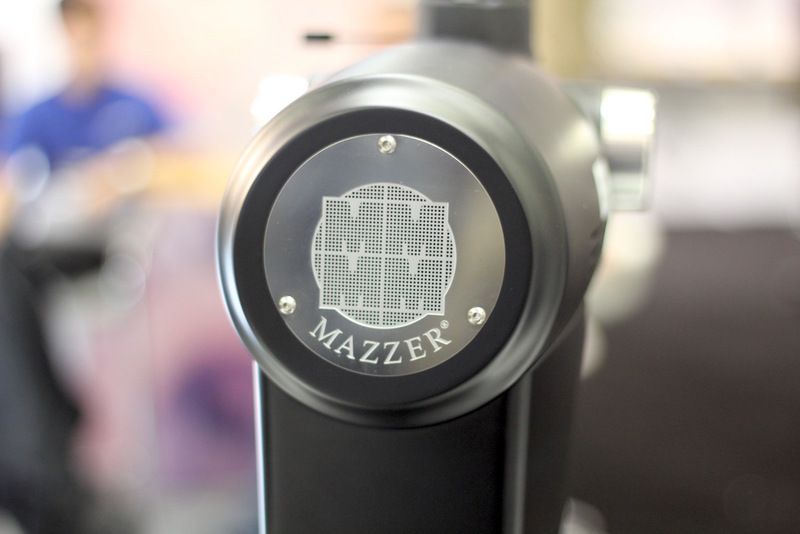 Meanwhile the Mazzer Mini has also received a filter-oriented update. User feedback over the years and its own recent testing have indicated to the company that the 58-mm flat-burred grinder was already an effective tool for lower-volume brewed coffee use, and to support users in that market, a new iteration of the same basic grinder features a more coarsely-oriented adjustment collar and a receptacle instead of a portafilter fork. 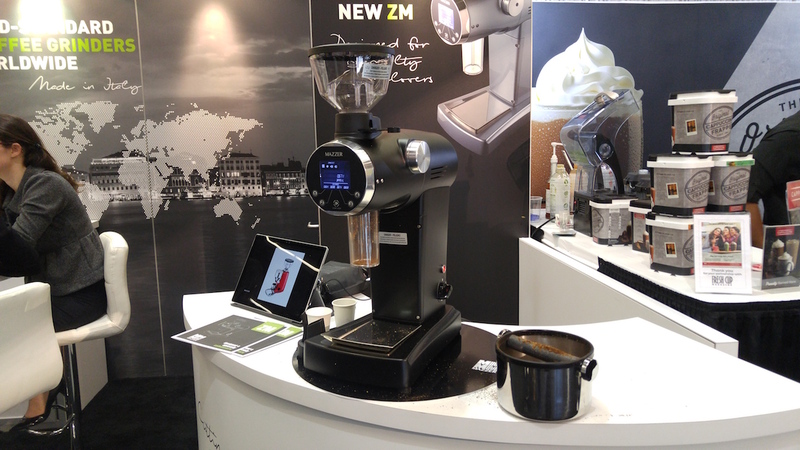 The Mini Filter is available now, and the Mazzer ZM will begin shipping in September of this year.